A business card is a small rectangular card that boasts the address, name, and phone number of a business or a person. It is one of the best and cheapest way to get exposure for a business. In the digital era, you don’t have to visit a professional designer or hire a freelancer to create a business or a visiting card. Also, you don’t have to buy a business card holder or box to store your cards. 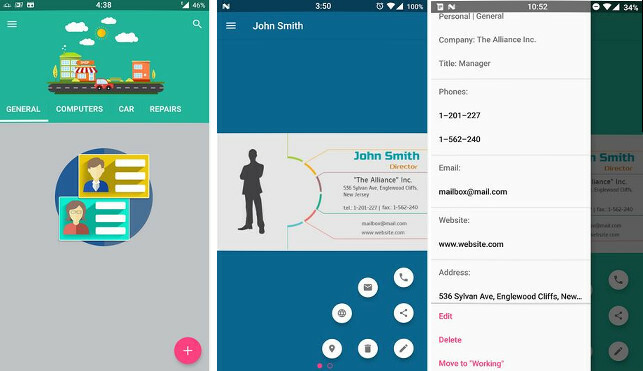 The Android or IOS apps can save business cards on your phone. They also let you design professional looking business cards for free. Eight is a LinkedIn like a social network for business professionals. It has been developed by Sansan, a Japanese firm. 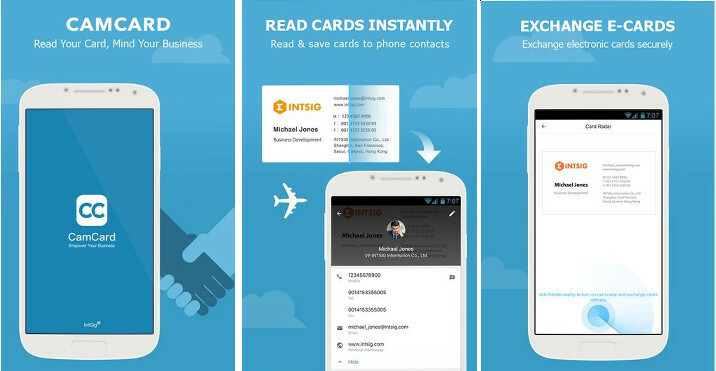 The app scans your business card and creates a profile based on the information printed on the card. Digitization is done by the staff working on Sansan’s Eight project. Once your Eight profile is ready, you can add work experience, skills, previous jobs, qualification to it. The application allows you to tag your contacts. It also provides an option to add notes to contacts. Eight allows users to publish new posts. As in LinkedIn and Facebook, users can control the visibility of their posts in Eight. The application enables you to connect with other users by scanning their business cards. With 10 million users, CamCard is the most popular business card app on the Google Play and Apple App Store. The free version of CamCard allows you to scan and save 200 cards. It has a beautiful user interface. The app uses a smart OCR algorithm to covert the text printed on a business card into an e-card/contact. The app’s OCR utility recognizes characters of 17 different languages. Camcard supports batch scanning operation. It has a special feature called Radar with which you can find CamCard users nearby you. Users of this app can share cards they’ve scanned with other users via QR code. If the person in your CamCard contacts is using this application, you can send messages to him/her. 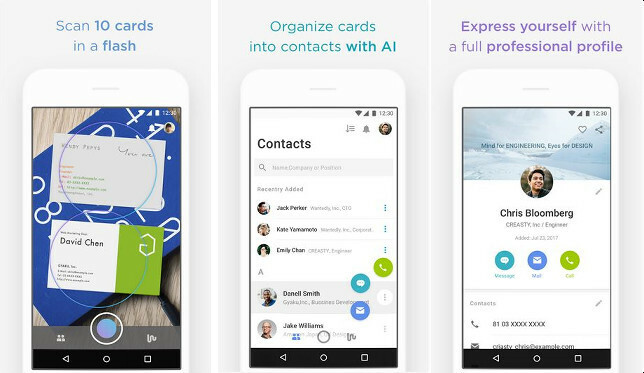 CamCard app lets users merge and group contacts. It saves your data in a cloud server. Hence, you can access your contacts on PC or a mobile device. BCH is an Android app that takes photos of your business card and saves it on the MicroSD card of your phone. BCH can upload the pictures of your business card to the Google Drive. It lets you filter photos by category and search e-cards by name. The BC Holder app supports voice search function. You can change the quality of the scanned image, specify sorting method, change the theme in this app. 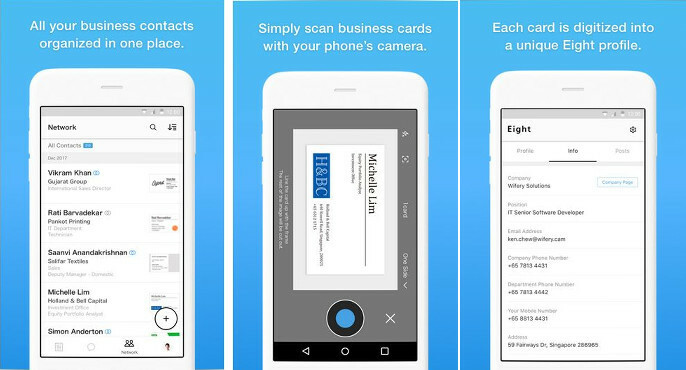 Although it’s not as popular as Eight and CamCard, Wantedly is a great business card scanner app. The app allows you to scan business cards without logging in, but to save the cards, you must log in to the app. Once you register an account, Wantedly will ask you to create a profile. The app can use the information printed on your business card as your profile details. To use this feature, you must scan your BC with this app. If you don’t have a card, you can manually enter your profile details in this application. The Wantedly app can scan up to 10 business cards at a time. Once it finishes scanning your cards, the app will analyze the cards with its smart OCR utility. Wantedly can sync the contacts/e-cards to your device. It enables users to export and import their e-cards. Wantedly app has a beautiful interface. It is fast, free and easy to use. 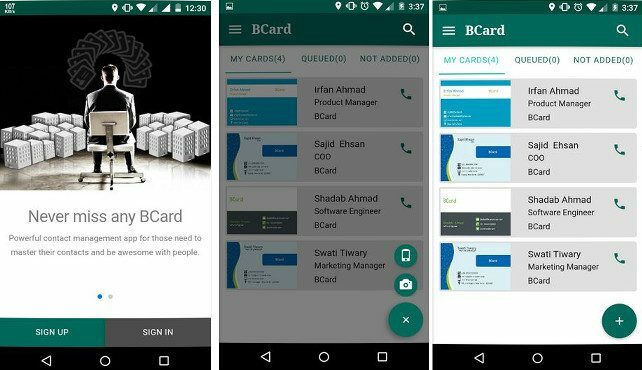 BCard is a free Android app that has 50k users. Its main interface features three tabs. Cards that have been digitized successfully appear in the BCards section. Images that are in the processing queue are displayed in the processing section. Cards that the app failed to analyze appear in the Failed section of the app. To get started with BCard, users must register an account and scan a business card. BCard processes the picture you upload within 3 minutes. The free version of BCard lets you upload and store up to 10 cards in your BCard account. This is the biggest limitation of this application. If you’ve logged in to the app with your Google account, it can automatically sync your data to Google account. The BCard app can export your contacts to an Excel file. It allows you to tag your business cards. It includes a search option. LC also provides an option to add text, logos, and icons on the card. It also allows you to change the background color of the card. Users of the Lenscard app can change the font and color of the text. They can also preview the front and backside of the template before customizing it. The app supports 300 fonts and provides 250+ business card templates. BCM is a free app from Light Creative Labs that provides 100+ unique business card templates. 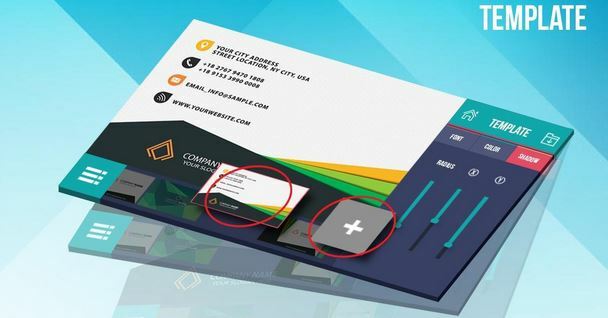 To create a business card, you must select a template. Then, you must customize the template’s font and back side. The app lets you add logos, text, borders, lines, and images to the templates. It also allows you to change the font, orientation, color, opacity, size of the text. If you don’t like the default templates, you can create a new template with this application. Once you’ve finished editing the template, you can save your work as a draft or export the card to the gallery. Advantages of the above apps over reverse number lookup apps and business sites. Reverse phone lookup apps have a database of 100+ million phone numbers. One or more people using this app might share the same name. Unless a person has uploaded his/her display picture, it is difficult to find a person by his name in a reverse phone lookup applications. Yelp and Google Places are the two most popular business review websites. Businesses fear to get negative feedback from customers. Hence, despite being a free service, not every business is registered on Google Place or Yelp.